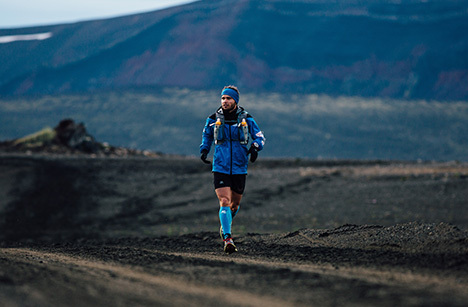 Marcos Yanez is an ultra-runner really committed in charity runs. he decided to embrace this cause. in this cold and inhospitable land. Yet, Marcos Yanez has once again a new challenge for this year: running 300 kilometers alone in Alaska in favour of worldwide bone marrow. He faced this challenge in only 5 days! His journey was cut in 5 legs going from “Eklutna Lake” to the inspiring and evocative “Magic Bus” from the movie “Into the Wild”. It was significant for him to finish his journey at the Magic Bus of Into the Wild. 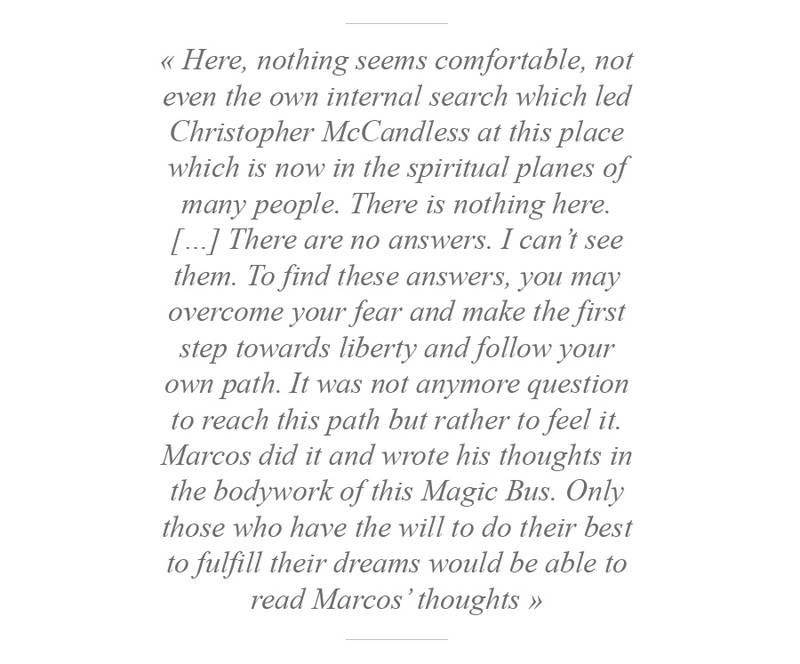 This place has become a pilgrimage site, which has inspired and encouraged thousands of people to believe in their dreams (and to realize them). He wanted to claim his involvement for bone marrow at the bottom of the Bus 142 as Christopher Mc Candless did 26 years ago. Marcos Yánez in front of the "Magic Bus" of the movie "Into the Wild"
Marcos Yanez’s journey began with the climb of Bold Peak in a freezing cold with only mosquitos as travel companion. to “Twin Peak” to find another way to reach “Wolf Lake”. they were forced to retrace their step. and “Wolf Lake” to “Hatcher Pass Lodge”. After climbing the Lazy Mountain in a freezing cold, his journey in Alaska led him to run on a sunny road. A sun cream was recommended since there were temperature changes higher than 20 degrees in some places. Upon his arrival at “Hatcher Pass Lodge”, houses were surrounded by snow. This landscape was totally in contrast with the sun that has followed him during the afternoon. At around 15 kilometers of Petersville, supports were not able to follow Marcos Yanez anymore. Accordingly, his team and he had to finish this stage alone. The fourth step was high in emotions. Indeed, the race began in Denali - one of the most mythic North American National Park. But, the most striking was the special guest: Christy Youngblood. She ran again for the first time since she overcame her cancer one year and half ago. The fatigue begins to be felt for Marcos. During the fourth day, Marcos Yanez was more and more suffering from tiredness. Preparation is crucial when you are about to run 300 kilometres in only 5 days. The last step was marked by the arrival at Magic Bus. Indeed, Sandra Hinton and Jonathan Leon met for the first time since Jonathan received Sandra’s bone marrow donation. Through this experience and the hashtag #Runforleucemia, Marcos Yanez wanted to send a clear and strong message: the importance to combine sport and solidarity to sensitize people to the bone marrow donation. Leukemia affects more than 50,000 people around the world each year. His main goal is to make the world aware of the importance of bone marrow donation. To achieve this goal, he attaches great importance to telling true stories of daily fights and struggles against leukemia. These stories played an inspiring role in Marcos’ attempting to reach the finishing line in Alaska. Donors have a real and crucial role to play in the healing process. However, the probability to find a compatible donor for a leukemia patient is lower than for others illness. That is why, the only way to increase survival chances of people suffering from leukemia is to raise the number of potential donors. BV SPORT is really proud to be the sponsor of this run and this magnificent initiative.